Today I shorted KV.A but later I covered it. The reason was simple: I think that all this recent KV.A action was designed by some big holders (may be by recent buyer that bought 10M at $3.25). The KV.A pattern is similar to JAZZ and designed scenario should be the same: "this stock will never die" only grow in spite of any bad news. JAZZ lesson was learned: never play against "big money". So, I covered KV.A short positions and may be will bought it. I hope that "big holders" want KV.A pps $10 or higher. They already absorbed all float during these 2 days and now they will dictate KV.A price. KV.A "new drug" approved by FDA is a joke: it's 50 years old drug that was abandoned by previous NDA holder (BMS) because of unknown reason. "In 1956 17 alpha-hydroxyprogesterone caproate (17 OHP-C) was approved under the trade name Delalutin® (NDA 10-347) for use in pregnant women for the treatment of habitual and recurrent abortion, threatened abortion, and post-partum “after pains”. In 2000 the Food and Drug Administration (FDA) withdrew approval for Delalutin® at the request of the holder of the New Drug Application (NDA), Bristol-Myers Squibb Co, because the company was no longer marketing the drug." "KV Pharmaceutical Co. acquired the rights to Gestiva, a drug for use in the prevention of preterm birth in certain categories of pregnant women, for $82 million in cash, KV announced ". Gestiva's new drug application is awaiting approval from the Food and Drug Administration. Once approved, KV will pay Bedford, Mass.-based Hologic Inc. $82 million, $7.5 million of which is payable at closing, for the U.S. and worldwide rights to Gestiva, according to a release." All this story is a complete nonsense. But "big money" started a "big game" so it's better play with them than against them. “Money does not smell” said by Roman Emperor Vespasian to his son Titus, when he ordered a new tax on public bathrooms. Disclosure: may be I will opened KV.A positions (speculative short-term investment) at good entry price ($7 or below). One subscriber asked me at what KV.A pps it's better leave this stock. Honestly, I don't know. Today KV.A chart showed that KV.A growth is really anomalous: almost all biotechs were red today, but KV.A added almost +15%. Based on JAZZ experience (gloomy one) it's possibly to say that big holders can drive KV.A pps to any level: $15, $20 or higher. JAZZ was pumped but this company can be crashed by some negative event: if JAZZ lose the patent litigation about Xyrem pps will drop at least 50%. So, what is possible negative event for KV.A? Recently KV Pharmaceutical Co. " said that it plans to sell nearly 10 million shares at $3.25 each to a group of institutional investors for a total of $32 million. The Bridgeton-based drug maker said it would use $20 million of the proceeds from the sale of its Class A common stock (NYSE: KV-A) to repay certain outstanding amounts and other outstanding obligations under its credit agreement with affiliates of Centerbridge Partners and the remainder for general corporate purposes, including the launch of its preterm labor drug Makena." Usually it's negative event for biotech but for KV.A it was a catalyst event: pps started to grow like crazy after these news. So, what about future Makena sales? "KV Pharmaceutical said the list price of Makena will be $1,500 per injection. Intramuscular injections are administered weekly starting between 16 and 20 weeks of gestation, and continuing until 37 weeks of gestation or delivery, whichever comes first, the company said. KV believes that patients will receive approximately 15-20 injections on average. The company anticipates that commercial payers and state Medicaid programs will cover and reimburse Makena. The drug will be manufactured by a third-party contract manufacturing organization and is expected to be available for prescribing before the end of March." And how many patients per year? "Preterm birth is defined as delivery before 37 completed weeks of gestation. According to the New England Journal of Medicine, preterm births have historically accounted for up to 85% of all pregnancy-related complications and deaths in the United States. The March of Dimes estimates that more than $18.1 billion in costs were associated with the care of preterm or low-birth-weight infants in 2003. Women with a history of preterm birth represent one of the highest risk groups for a future preterm delivery. "Despite the two-year decrease, more than 500,000 infants are born prematurely in the U.S. annually, the Los Angeles Times reports (Maugh, Los Angeles Times, 5/11). Premature birth is the top cause of newborn death and a leading cause of lifelong disability (USA Today, 5/12). The report noted that the U.S. preterm birth rate continues to exceed that of many developed countries, and it called for more research into factors that contribute to premature births in the U.S. (Fox, Reuters, 5/11). The report noted that the percentage of infants born from 34 to 37 weeks decreased from 9.1% in 2006 to 8.8% in 2008, while the rate for infants born prior to 34 weeks fell from 3.7% to 3.6%." So, even only 50,000 pregnant women will take Makena: 50,000X$30,000 = $1.5B per year! In Feb. 22 I sold KV.A at average $9.73 so today I see a good entry price. "Big money" will continue to drive this stock to wanted pps. Same situation you can see with JAZZ and VRUS. I think that it's a good idea to use these "designed scenarios" and make some money. Both JAZZ and VRUS already have absurd pps, so in right moments they will be good targets for short (JAZZ pps should spike after Q4 and annual earning, if pps reach $26-27 I think it will be good moment). VRUS is waiting for phase II trial results release so short it at peak will be good ("sell news", VRUS will start phase III and have results only after 3-4 years and everybody knows that sometimes (30-40%) phase III results is much worse than phase II). Well, KV.A absorbed all bad news likely a sponge. KV Pharmaceutical plans to sell $200M in debt? Today market is not good? KV.A doesn't care about it. Pps is $10.30 and still run up. Buy and short tactics for KV.A is enough profitable. I covered short positions today and will think about to catch new upside wave. $8 can be good entry price. Today is good day for KV-A day traders. I did some buy/sell transaction (bought 20k at $4.70 and sold it at average $5.00). May be at some point KV-A will be a good short target. However, KV-A pps is still very unpredictable because this FDA news. WASHINGTON, March 30 (Reuters) - The U.S. health regulator said on Wednesday that it did not plan to take enforcement action against pharmacies that compound K-V Pharmaceuticals' (KVa.N) pre-term birth drug based on a valid prescription, sending the company's shares down more than 30 percent. However, the U.S. Food and Drug Administration added that it may at any time revisit a decision to exercise enforcement discretion, leaving some room open for future regulatory enforcement regarding compounding the drug. 20X$20 (17P)=$400 unborn baby is under risk because of 17P origin and chemical composition. FDA will check 17P and if it found one sample without active compound or even different concentration it should stop 17P prescription. Disclosure: I will open KV-A positions today. Several words about these "Securities Class Action Lawsuit Against K-V Pharmaceutical Company and Its Senior Executives on Behalf of Investors"
"The complaint also alleges that defendants told investors K-V's Makena distribution program was designed to "expand access" to the drug compound, including to low-income and other at-risk groups, while concealing that the $1,500 list price K-V was charging would actually reduce availability of the drug compound to physicians and their patients." There are no ways to win these lawsuits for this absurd reason: "$1,500 list price K-V was charging would actually reduce availability of the drug compound to physicians and their patients"
For example JAZZ is charging narcolepsy patients $40,000 per year and their drug Xyrem just slightly reduces an excessive daytime sleepiness in patients with narcolepsy. So the insurance companies pay $40k per year to reduce "an excessive daytime sleepiness"? Makena will cost 20X$650=$13k per year and it may save unborn baby. "eight of 10 active ingredient samples and 16 of 30 finished product vials failed to meet FDA standards for unknown impurities. One of 10 active ingredient samples and five of 30 finished product vials failed FDA potency standards, according to the data supplied by KV. One of the active ingredient samples was found to be glucose rather than hydroxyprogesterone caproate"
So, the doctors that continue to prescribe 17P are actually the killers of unborn baies... And insurance companies that reject Makena also help to kill babies. Disclosure: I have KV-A positions. $13k per year is a reasonable price for drug that may save unborn babies. I'm not sure that 17P from Chinese suppliers is a good drug. BTW what is 17P or Makena? 17α-Hydroxyprogesterone caproate is a synthetic steroid hormone that is similar to medroxyprogesterone acetate and megestrol acetate. It is an ester derivative of 17α-hydroxyprogesterone formed from caproic acid (hexanoic acid). 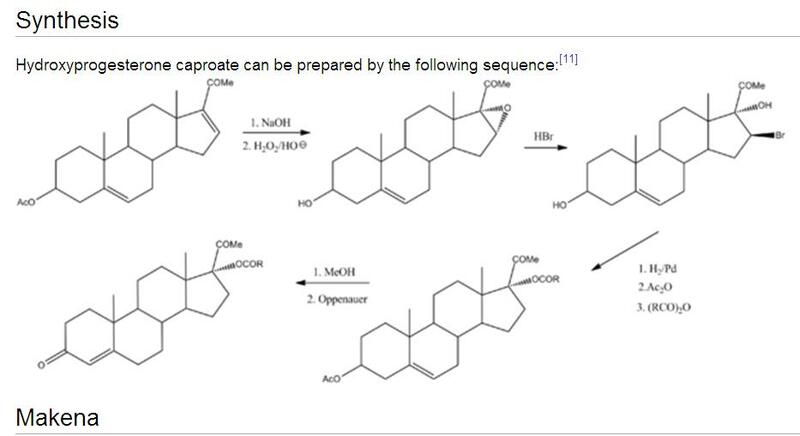 I'm not chemist but I see that it's enough complicate synthesis reaction pathway to get pure Makena. KV-A do need GLP/GMP facility to get it. Question is how the compounding pharmacies synthesize the low-cost version 17-P? "Testing determined eight of 10 active ingredient samples and 16 of 30 finished product vials failed to meet FDA standards for unknown impurities. One of 10 active ingredient samples and five of 30 finished product vials failed FDA potency standards, according to the data supplied by KV. One of the active ingredient samples was found to be glucose rather than hydroxyprogesterone caproate, KV said. David Miller, executive director of the International Academy of Compounding Pharmacists, criticized the FDA’s move and said he may do a separate analysis of compounded products. “The agency is taking a knee-jerk response to allegations from KV Pharmaceuticals,” Miller said by telephone. He said he has not seen KV’s data. The pharmacy organization may contract with an academic institution to conduct its own study of 17-P, Miller said. Of course the glucose solution is very safe but it will not save unborn babies. The truth is that the compounding pharmacies ordered the synthesis of 17-P in China and thus the price of 17-P is so low. But they don't care about 17-P efficacy. They only asked to deliver "safe medication" that will not kill pregnant women. Recently heparin stock imported from China killed 81 people in the United States. Question is how many unborn babies were killed by ineffective 17-P from China?